If you’re taller, you might want to sample versions of the 2014 Kia Soul with and without the available panoramic sunroof. The 2014 Kia Soul doesn’t stray from its iconic profile, but it dons more sophistication inside and underneath—with fewer compromises and all in the name of city-friendly, tall-wagon goodness. 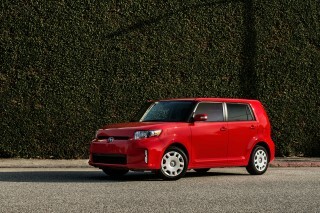 The Kia Soul has a distinctive style that's driven it to wide appeal. Since it was new for 2009, the Soul's established itself as a versatile hatchback with more that its fair share of funky appeal--and it's been one of Kia's biggest hits in its big growth, along with the Sorento and Optima. This year, the Soul gets its first major redesign, and it's a carefully crafted second act that does nothing to dilute its visual appeal, and lots to improve its few faults. In updating the already-bold Soul to Kia’s latest small-car platform (shared with the new 2014 Forte), it’s not surprising that the automaker took an ‘easy does it’ approach—making the new model look like a slight evolution, while addressing some criticisms of the outgoing model. 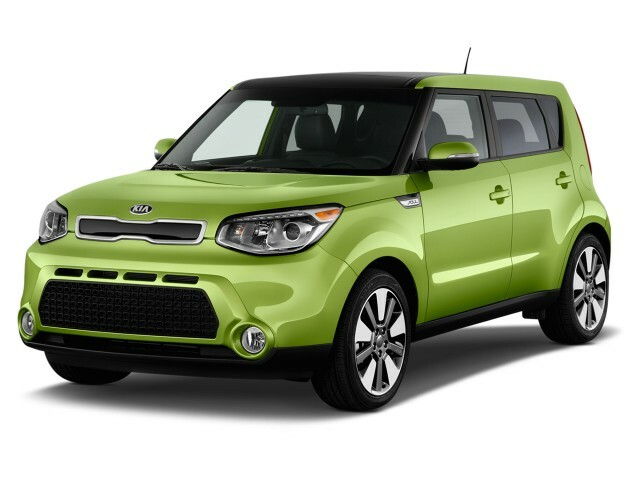 Namely, the 2014 Kia Soul is more comfortable; it rides and handles better; and it packs in even more features than before. From what we can see, the brand has delivered exactly that, and what it needs to keep this niche hit rolling into the mainstream. Stepping back a few paces, the fundamental proportions haven’t changed. Within an inch, it’s the same size as before; and from the side profile, it still has the same abrupt windshield pillar and somewhat canted-back look to the roofline. In back, the look of the hatch has been changed a bit more with a new ‘floating' body-color panel and blacked-out areas to help accent the bolder taillamps, and the combination of a higher ‘grille’ and smoothed upper beltline serve to make it look perhaps a bit taller. Inside, there’s the greatest level of change, with soft-touch plastics on the dash, doors, and console, and leather seats back on the options list. LED mood lighting makes a kitschy appearance against the circular design theme. Piano-black trim finishes off the look, while the center stack cants slightly toward the driver. The big news regarding performance is that the new Soul handles much better than before, thanks to a better chassis and a retuned suspension. Kia says the new body is almost 29 percent more rigid, with more high-strength steel. The strut front suspension has a relocated roll bar, and the torsion-bar rear has a thicker tube, plus vertical, dual-path shocks for better ride isolation—while overall suspension travel has been increased. Altogether, it rides softly and smoothly, yet responds progressively and predictably when you need it to. The Soul's electric power steering has optional Flex Steer, which lets drivers choose from three settings for steering feel—comfort, normal, and sport—though the difference in feel is negligible. Engines aren’t quite carryover, but with nearly a 100-pound weight gain for the new model, you won’t find the 2014 model any quicker—or more fuel-efficient than before. We’d probably recommend against the base 1.6-liter four and its 130-horsepower, 118-pound-feet output unless you’re getting the six-speed manual transmission. Otherwise, Soul Plus and Soul Exclaim hatchbacks are fitted with a 2.0-liter, direct-injection four-cylinder with 164 hp and 151 lb-ft of torque, along with a six-speed automatic (optional on the base). The Soul isn't a downright sporty car in any of its combinations; but with the larger engine you’ll find the Soul quick enough—although tall gearing leads to frequent downshifts on the highway, and the transmission tends to hunt on long grades. Even with the cabin essentially the same size, Kia has functionally improved the Soul's packaging, carving out a little more interior space and improved comfort. Dual-density foam and somewhat extended seat cushions help in front; so do modestly improved ergonomics in front, with more steering-wheel controls and the center-console controls canted slightly toward the driver. It’s very easy to get in and out, in front or in back. The only caution is that the Soul has the width of a small car, so even though there’s plenty of headroom and legroom, fitting three adults across in back is a no-go. The rear hatch opening wider by a couple of inches, and seats fold forward easily. And with more sound insulation and padding, the Soul's interior noise levels have fallen by a few decibels. Yet as Kia has made tremendous improvements to reduce road noise in the Soul, it hasn’t made as much effort at the firewall; the boom from the four-cylinder engines underhood is in the same league as other small econo-cars, so that's the only blemish on its sheen of refinement. Safety hasn’t been a strength for the current Soul, but we hope that will improve with the 2014 model, which is built on an entirely new structure. 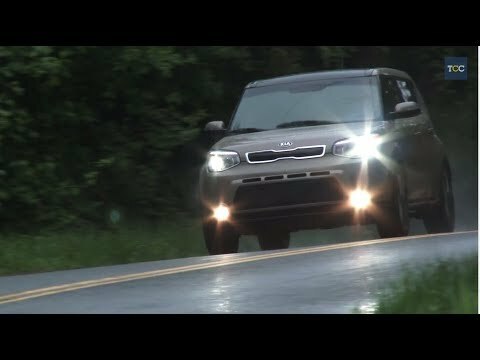 Kia says that the new Soul has different load paths than either the former model or the other models that it’s structurally related to, and that should help with the tough new IIHS small overlap frontal test; for now the IIHS has tested and rated the Soul as 'good' in all other categories. All models include a total of six airbags, with dual front airbags, seat-mounted side bags, and full-length side curtain bags. Also worth noting that even the base Soul includes superior four-wheel disc brakes, while many other inexpensive small sedans include just drum brakes in back. There are three different trim levels: base Soul, Soul Plus (+), and Soul Exclaim (!). Prices start at just $15,495 for a reasonably well-equipped base model with a six-speed manual gearbox and the 1.6-liter engine. But if you’re willing to add a four-figure sum to that modest bottom line, you can load up a Soul to include things that are unusual in a mainstream model--like a heated steering wheel, heated rear seats, and cooled/ventilated front seats. What’s more, connectivity and infotainment—and the optional navigation system—are fully up to snuff with the systems available in much more expensive, premium vehicles. That new UVO eServices infotainment system uses an excellent new eight-inch capacitive screen and, with navigation, and based on a quick first introduction in a pre-production Soul, it looks like one of the better systems on the market, even casting upward to luxury brands. Based on an Android linux operating system, it doesn’t suffer from the lagginess that plagues some such systems, and with plenty of apps planned for the future (Pandora and others are just the start) plus potentially easy upgrades through the SD card slot. Kia redesigned what’s become a design icon, and ended up with an even more handsome vehicle—with an interior that this time sets its own great style. The original Kia Soul is a tough act to follow. It’s one that was central to the brand’s “design-led transformation” that started a few years ago and is still happening now to some other models in the lineup. So what did Kia do this time? It gave the Soul a little more personality where it was arguably lacking last time—inside—without going overboard with it, and then evolved the exterior look, making the flared wheel wells a little more subtle and graceful, smoothing out the sides a bit, and then giving it an all-new look in front and in back. Kia points to the 2012 Track’ster concept car as the point of inspiration for the Soul; it helped set the proportions for the redesigned Soul, and provided a new direction for some of its details and design cues. 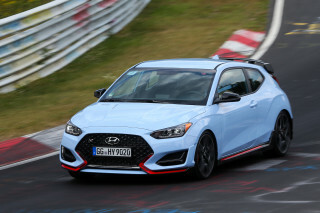 In front, the new Soul closely apes the look of the Track’ster—especially in the shape of its lower air intake—and with the ‘grille’ and headlamps tucked upward somewhat, the overall visual effect is that the hood is considerably higher, even if it’s not. In back, the look of the hatch has been changed with a new ‘floating’ body-color panel, and strategic blackout areas to draw attention to new, more bulbous, high-contrast tall taillamps. The liftgate opening is now 2.4 inches wider, too. 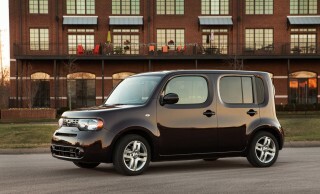 One thing that hasn’t changed much is the Soul’s roofline and fundamental proportions. Kia notes that the wheelbase and overall width are both up by nearly an inch—and the new model is built on an all-new platform—yet from the side profile, it still has the same abrupt windshield pillar and somewhat canted-back look to the roofline. Inside, the Soul gets what we would call an all-new look, with a chunky steering wheel, a gauge cluster that’s sportier, and a dash that looks and feels more premium, with soft-touch materials from elbow level on up throughout most of the dash area. Speakers are elevated atop side vents on the dash, and center-stack climate, audio, and infotainment controls are all canted slightly toward the driver. In all, it doesn’t just bring this model in line with other Kia interiors, but it makes this interior more convincingly upscale in look and feel. The 2014 Kia Soul is not a sporty vehicle, but it handles surprisingly well and accelerates well enough for most needs, provided you pick the 2.0-liter engine. The 2014 Kia Soul is an adequate—even somewhat athletic—performer all-around, but it needs to be taken in context. 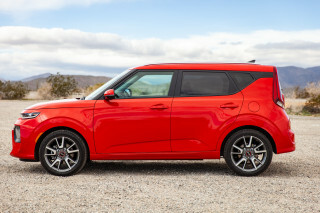 If you’re out to satisfy a performance craving or tend to attack curvy canyon roads as if you were driving against a stopwatch, the Kia Soul isn’t for you; but if you plan to zip along city streets and maneuver out to stock up at big-box stores in the burbs, the Soul likely has all the performance you’d expect to find in this kind of vehicle. That said, we have a sneaking suspicion that the 1.6-liter in-line four-cylinder engine that’s standard on the 2014 Soul (making 130 horsepower and 118 pound-feet of torque) might not be quite enough if your routine regularly includes hills or high-speed expressway driving with a full load. We thought the last generation felt a bit winded with the 1.6, so considering this new model’s nearly 100-pound weight gain in base form, we’d advise against it, at least until we can get a drive in one. One plus for choosing the 1.6-liter is that you can get it with a six-speed manual gearbox as well as an available six-speed automatic, while the larger 2.0-liter four is only offered with the automatic. 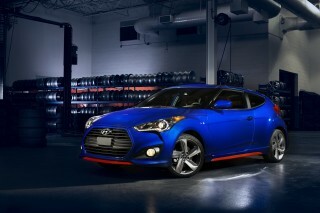 Models with the 2.0, which makes 164 hp and 151 lb-ft, have performance that most drivers will find perfectly adequate. They move reasonably quickly around town, and the transmission is quick to respond with downshifts when needed, out of corners or when accelerating from traffic snarls. Unfortunately, this downshift eagerness gets a bit out of hand on the highway, where a very tall sixth gear has the transmission bouncing back and forth between fifth and sixth with very slight tips into the accelerator, or very slight uphills. This type of ‘hunting’ behavior is relatively rare today, and most automakers have tuned it out with transmission programming (having it just hold the lower gear for an extended time). A manual gate, however, lets you lock in a particular gear, only forcing an upshift near redline (not for full throttle). Steering is much-improved in the new Soul; in addition to some hardware changes that bring better steering feel, a better sense of center, and better weighting off-center, the 2014 Soul includes a system called Flex-Steer. Toggle with a steering-wheel button between Comfort, Normal, and Sport, and you can change the amount of steering effort on the fly. It’s no novelty, but we do wish there would be a wider difference between modes—it’s all quite subtle. The 2014 Soul is built on a new, much stiffer structure than before, and that’s allowed engineers to add more suspension travel overall while more closely tuning handling and ride characteristics. But what makes the biggest difference is that it’s using new twin-path dampers—essentially allowing better body control and a more reassuring feel when you push it hard into corners, while also offering better isolation from the smaller bumps when you’re pointed straight ahead. All three trim levels of the Soul include four-wheel disc brakes—a noteworthy upgrade versus the rear drums you get in many other econo-sedans in the Soul’s price range. The 2014 Kia Soul fits a whole lot of passenger and cargo space in a neat little subcompact-car parking footprint; and it’s even more comfortable and refined than before, without becoming bigger or bloated. The 2014 Kia Soul, in simple terms, shows how it’s done—fitting an incredible amount of passenger space and versatility into a very manageable, maneuverable (and stylish) exterior. Because of how low the instrument panel is mounted in the new Soul, the driving position tends to feel quite high—a trait that shorter drivers will appreciate. Taller drivers will want to lower the seat a bit more than the adjustment allows—you’re scooped up a bit close to the roof, although models without the panoramic sunroof should give you a little more perceived space up there. In any case, the front seats in the 2014 Soul adopt a new dual-density foam construction, which helps tremendously for the big and tall. In back, there’s plenty of headroom and legroom for all but the tallest adults—even this 6’-6” tester would be comfortable enough for several hours back there. Also adding to the impression of space is how the Soul’s sides don’t appreciably narrow up to the roof. There’s only one caution about seating here: The Soul is still a subcompact car in terms of width, so if you’re going to try to fit three adults across in the back seat—no matter how skinny they are—you might strike out. Luckily, in Plus and Exclaim versions, there’s a fold-down center armrest that could serve as a useful dividing line for at-odds siblings. And across the lineup, getting in and out is easy, whether you’re talking about the front seats or the back ones. The one criticism that keeps us from giving this model a perfect 10 is that, as much as Kia has improved noise insulation, by adding special measures to seal out road noise—and even wind noise—it only serves to emphasize that they missed the firewall in this process. At least in the 2.0-liter models that we sampled in an early first drive, the engine could be especially boomy when accelerating reasonably hard from a stop, or even moderately up a gradual grade; it’s the only serious demerit for a package that otherwise feels so polished and refined. Thanks to an all-new body structure, safety ratings for the 2014 Kia Soul should graduate to the top tier. Since the 2014 Kia Soul has an entirely new structure that’s not at all related to the outgoing model; and it's quite the turnaround in occupant protection compared to that lackluster performer. Safety ratings are almost entirely out for the new Kia Soul, and it's earned top five-star federal safety ratings, as well as the Insurance Institute for Highway Safety (IIHS) Top Safety Pick+ nod. Kia goes so far as to say that it expects to make the new Top Safety Pick+ list, although the IIHS hasn't yet released results for the model in that category. All models include a total of six airbags, with dual front airbags, seat-mounted side bags, and full-length side curtain bags. Also worth noting that even the base Soul includes superior four-wheel disc brakes, while many other inexpensive small sedans include just drum brakes in back. Anti-lock braking, Brake Assist, and electronic stability control are all included, as is Hill-start Assist. Outward visibility is still a mixed bag—great out in front and to the side, with a rather high driving position, but somewhat difficult for lane changes due to the thick rear pillar. A rear camera system is included with the top Exclaim model, as well as with the Soul Plus, provided you get the $500 UVO eServices Package. A heated steering wheel and ventilated, cooled front seats, and HID headlamps in a compact car? The 2014 Kia Soul packs all that into top-trim versions; but it’s quite the deal at the base level, too. The 2014 Kia Soul is offered in three different trim levels: base Soul, Soul Plus (+), and Soul Exclaim (!). Prices start at just $15,495 for a reasonably well-equipped base model with a six-speed manual gearbox and the 1.6-liter engine. But if you’re willing to add a five-figure sum to that modest bottom line, you can load up a Soul to include things that are unusual in a mainstream model--like a heated steering wheel, heated rear seats, and cooled/ventilated front seats. What’s more, connectivity and infotainment—and the optional navigation system—are fully up to snuff with the systems available in much more expensive, premium vehicles. For just $15,495, the base Soul includes power locks, windows, and mirrors, heated mirrors, a tilt/telescopic steering wheel, Bluetooth hands-free connectivity, and a six-speaker sound system with USB and auxiliary inputs as well as SiriusXM satellite radio with a three-month introduction. 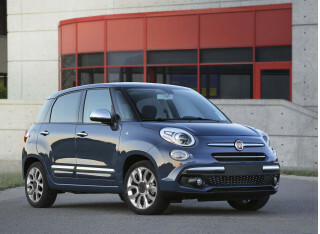 At the Soul Plus level, you get larger 17-inch alloy wheels, turn-signal indicators in the side mirrors, automatic headlamps, and some other minor cosmetic differences, plus a rearview camera system, rear-seat center armrest, and a floor-console storage box with integrated armrest in front. It also includes the larger eight-inch display, as well as the UVO eServices suites of apps and extras. Curiously, this new system is based on an Android linux operating system—not Microsoft, as in other versions of UVO—and based on an early encounter with this system we found it refreshingly quick, without even a hint of the lagginess that some other such systems have. Step up to the Soul Exclaim and you get 18-inch alloys, fog lamps, projector headlamps, and LED running lamps front and back. Inside, there’s special glossy piano black trim, as well as a cooled glovebox, a ten-way power-adjustable driver’s seat, an auto-dimming rearview mirror, and leather-wrapped steering wheel and shift knob. Options on both the Plus and Exclaim include upgraded Infinity audio, LED speaker-mounted mood lighting, navigation, and a panoramic sunroof, while you can option a top Exclaim to include HID headlamps, push-button start, automatic climate control, and full leather seating with heating and ventilation/cooling in front and heated outboard positions in back. 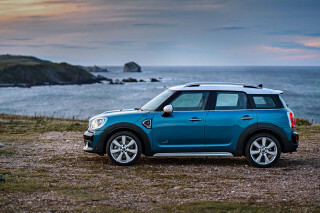 Altogether, the 2014 Soul Exclaim adds up to less than $27k with the whole shebang—literally, as you add something called The Whole Shebang Package ($2,500) to add the leather seats, ventilated front seats, heated front and rear seats, heated steering wheel, push-button start, HID low-beam headlamps, and Supervision gauge cluster with integral TFT color display. To get that, you first need the $2,500 Sun and Sound Package, including navigation, Infinity audio, speaker lights, auto climate control, and the panoramic roof. The 2014 Kia Soul is mostly as fuel-efficient as a small sedan—although its taller, boxier shape means highway mileage won’t be as great. Fuel economy numbers for the 2014 Kia Soul have risen slightly with the introduction of direct injection to the 2.0-liter engine, although the numbers for the base 1.6-liter model are slightly lower than before in the city. The 2014 Soul now rates at 24 mpg city and 30 highway with the 1.6-liter engine—and that holds whether you opt for the manual gearbox or automatic transmission. 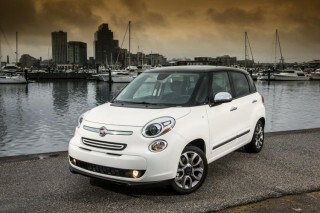 2.0-liter models, with the automatic, get 23 mpg city, 31 highway. 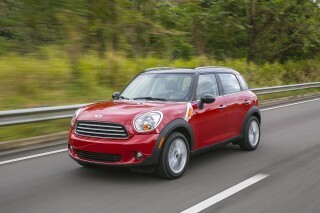 And if you opt for the Soul Eco model, you'll get the best mileage of the lineup, at 24 mpg city, 31 highway. On an early drive, we saw nearly 25 mpg over several hours and about 140 miles, with driving conditions mostly split between urban-freeway, commute conditions and rural, twisty, hilly two-laners. The Eco model includes a feature called Idle Stop and Go (ISG) plus low-rolling-resistance tires. The system could conceivably save up to six percent in particularly dense stop-and-go driving, by smartly shutting the engine off. Unfortunately, that kind of improvement doesn’t show on the window-sticker EPA rating. The Soul does include an Eco Mode button that softens throttle response somewhat and changes shift points.